← We Graciously accept another chaplet of Laurels! Huzzah! Something fun, and purely visual, for Saturday. Just as light-hearted & colorful as a USA Today bar graph, this sketch shows how history’s most famous diamonds stack up side-by-side. 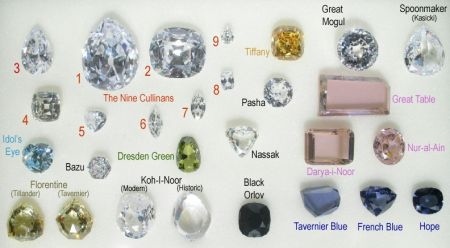 Image | This entry was posted in diamond, those envious gems and tagged famous diamonds. Bookmark the permalink. I’m slightly inclined toward that green one just because I think it’s the only one that shade. There’s something so seductive about having something no one else can. Obviously I’d “settle” for any one in the collection. I know there are a scant number of red diamonds out there…I’m a bit surprised they didn’t make the cut…oooh lord, that pun was so bad it was delightful!